The Capital Asset Pricing Model (CAPM) seeks to explain the equilibrium rate of return on all risky assets in terms of their exposure to a single market factor. The Fama-French (FF) model builds on the CAPM by adding size and value factors to the market factor with the objective of more comprehensively explaining stock and fund performance. Using historical data compiled by Fama-French, and Yahoo Finance, or user-supplied returns data, the Hoadley Factor Analyzer will analyze the exposure of individual US equity assets (stocks, funds, ETFs), and user-defined portfolios of assets, to both the Fama-French three-factor model, and the Capital Asset Pricing Model. The Excel application provides a flexible and very simple-to-use way of evaluating the extent to which the Fama-French model improves on the CAPM in explaining the performance of any combination of US equity assets over any time period. 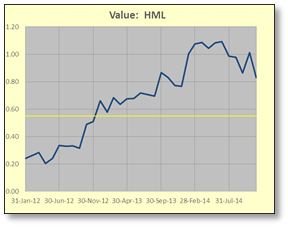 Fund manager performance can also be easily assessed using the Hoadley Factor Analyzer. If you suspect an active fund manager, while beating the market, is actually adding little value on a risk adjusted basis and are concerned you might be paying active fees for index performance, the Factor Analyzer will help you spot a closet indexer a mile off. The only inputs required are the ticker symbols of stocks and funds to be included in the analysis, their weights in the portfolio (which can be zero) and the range of dates to be included in the analysis. The application then downloads the data and produces all analyses with a single button click. Alternatively users can supply their own returns data if preferred. Factor basics: Arithmetic returns, geometric returns (CAGR) and volatilities for each factor, plus factor correlations. Asset exposures: Arithmetic returns, geometric returns and volatilities, annualized alpha, exposure to the Fama-French three factors, coefficient of determination (R-Squared), and risk decomposition into systematic and specific risk based on the FF model. Market exposure, R-Squared and risk decompositions are also shown for the CAPM for comparative purposes. This lets you see at a glance whether or not the FF three factor model does a significantly better job of explaining returns and variances than the CAPM. Information is shown for individual assets and in total for the portfolio. Drill-down: Right clicking an individual asset, fund, or portfolio on the analysis will produce detailed regression diagnostics, including standard errors, t-stats, p-values and 95% confidence intervals, both for the Fama-French model and the CAPM. Statistically insignificant factor exposures are highlighted for both models. Rolling window analysis: Rolling window charts are produced showing the exposure of each asset, fund or portfolio to each of the Fama-French factors (Rm-Rf, SMB, HML), and for the coefficient of determination to provide a visual indication of how exposures to these factors have changed over time. Drawdown analysis: A comprehensive drawdown analysis both in table and chart form can be produced to reveal additional performance characteristics for each asset or fund over the selected time period. The Hoadley Factor Analyzeris available for download to users who have purchased the Hoadley Finance Add-in for Excel and are still within their one year free download period.